Almost every environmental problem stems from the tragedy of the commons. The tragedy of the commons is where the lack of clear ownership leads individual parties to overconsume their “fair” share. Their actions create costs other people or parties ultimately pay. Since they don’t pay for the costs they’ve introduced, they continue to act in a way that is out of balance with a sustainable and equitable arrangement. Think about a company that dumps waste into a river and imposes a cost on those who live downstream. Unless they have to remedy the costs they have imposed on others, they will continue to “overconsume” their fair share of clean water. But there is one place where the tragedy of the commons doesn’t occur, and that’s in a free market with clearly defined property rights. In other words, if someone takes more than what they’re supposed to, they have to pay for it. Overconsumption doesn’t happen, leaving one party with less than what they should have, because they’ll be compensated for any abuses of their resources. 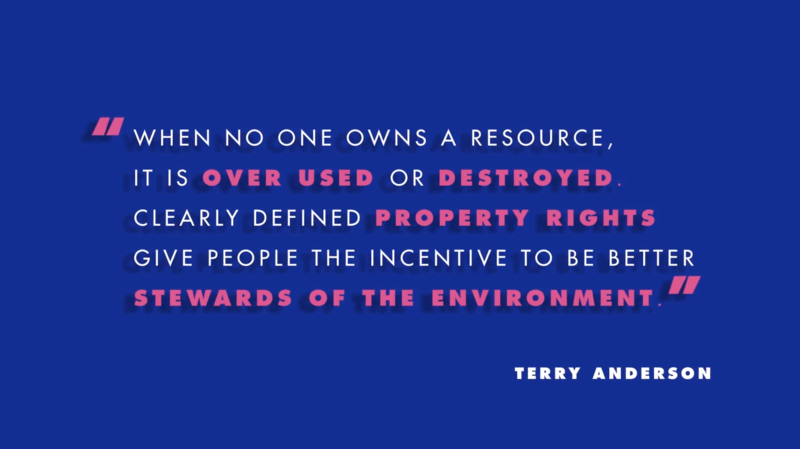 In this clip, Terry Anderson is talking about free market environmentalism, which is an effort to eliminate the tragedy of the commons by making sure all costs are accounted for by establishing clear property rights. Property rights compel owners to account for the costs and benefits of their actions and facilitate market transactions that create efficiency-enhancing gains from trade. Property rights and markets can provide the right incentives, without relying on altruism or good intentions. Free market environmentalism comes down to who holds environmental property rights. That could range from private individuals, to the government, to no one. But if the answer is that no one owns them, environmental tragedy will result. However, when property rights are well defined and enforced, markets get the incentives right for improving environmental quality. As Terry Anderson says, clear property rights make us better stewards of the environment.